Review: I didn’t think Brisingr could get any better… I was dead wrong. Brisingr and the two other books in Eragon’s saga, Eragon and Eldest, were written by Christopher Paolini. Brisingr was amazing but now it’s even better. The Deluxe Edition includes deleted scenes, a guide to the dwarfish ruins, illustrations drawn by the author himself and a marvelous fold out poster with astounding pictures on both sides. If you haven’t read Eragon’s saga stop reading this review so I don’t spoil it for you. 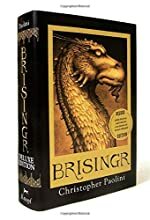 If you have read all the Eragon saga books then finish this review and go out and buy yourself a deluxe edition Brisingr book! The deleted scenes include a healing scene and an urgal scene. The healing scene is a scene where Eragon must heal a girl named Signa. Her husband Gull had come to Eragon, the only free dragon rider left, to heal his wife who had a horrible tumor. So Eragon must go to heal her and not kill her doing it. He must find a way to solve this hard puzzle. Later in the urgal scene Eragon is asking Garzhvog to tell him anther story. Garzhvog tells him the story of an urgal who changed himself into a deer for many years. I shall not tell you any more about it, for I don’t want to spoil it for you and I want you to read the book for yourself. The dwarfish ruins were interesting to study and learn. I wish I could write “good book” in the ruins for you. Alas, the computer will not allow it. And the fold-out poster - it makes you wonder which side to put up! The deleted scenes were dramatic and funny while the ruins and poster were a wonder for the eyes. I think this book can’t get any better and I can’t wait for the forth book to come out! I am completely OVERJOYED that I get to keep this book! Now I have every single Eragon book there is to have! Such a wonderful couple Gull and Signa are! Gull and Signa are both very good characters in this already too good to be true book. Gull is a strongly devoted husband and Signa is a very sweet girl. Garzhvog, the urgal, is a very inspiring urgal who is different from the rest of them because he is okay with humans. More than the other urgals would be able to say. Eragon is tied for best character with Saphira. Eragon is an amazing dragon rider and deserves his hard to get love, Arya. Saphira is a beautiful dragon with a peaceful mind. Just… don’t meet her in battle. This book has gotten 5 well deserved awards. They are: The #1 New York Times Bestseller, The #1 USA Today Bestseller award, The #1 Publishers Weekly Bestseller award, The Wall Street Bestseller award and The IndieBound Bestseller award. I gladly give this book 25 golden stars. Unfortunately I can only show 5 stars. So I must give this book a well deserved 5 out of 5 stars. We would like to thank Random House for providing a copy of Brisinger Deluxe Edition for this review. Have you read Brisinger Deluxe Edition? How would you rate it?